After President Donald Trump criticized players who do not stand during the national anthem, more players knelt in protest during Sunday's games. President Donald Trump’s comments about owners firing players who kneel during the national anthem sparked a mass increase in such protests around the National Football League Sunday, as more than 130 players sat, knelt or raised their fists in defiance during early games. A week ago, just four players didn’t stand and two raised their fists. Defensive star Von Miller was among the majority of Denver Broncos who took a knee in Buffalo Sunday, where Bills running back LeSean McCoy stretched during the “Star Spangled Banner.” In Chicago, the Pittsburgh Steelers stayed in the tunnel except for one player, Army veteran Alejandro Villanueva, who stood outside the tunnel with a hand over his heart. 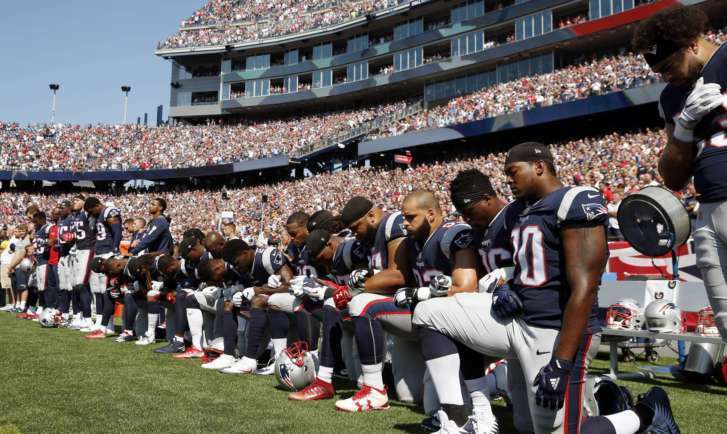 Tom Brady was among the New England Patriots who locked arms in solidarity in Foxborough, Massachusetts. The president’s comments turned the anthems — usually sung during commercials — into must-watch television shown live by the networks and Yahoo!, which streamed the game in London. In some NFL stadiums, crowds booed or yelled at players to stand. There was also some applause. NFL players, coaches, owners and executives used the anthems to show solidarity in their defiance to Trump’s criticism. In Detroit, anthem singer Rico Lavelle took a knee at the word “brave,” lowering his head and raising his right fist into the air. The issue reverberated across the Atlantic, where about two dozen players, including Ravens linebacker Terrell Suggs and Jaguars running back Leonard Fournette, took a knee during the playing of the U.S. anthem at Wembley Stadium. Jaguars owner Shad Khan and players on both teams who were not kneeling remained locked arm-in-arm throughout the playing of the anthem and “God Save The Queen.” No players were knelt during the British anthem. A handful of NFL players have refused to stand during the anthem to protest several issues, including police brutality. But that number ballooned Sunday following Trump’s two-day weekend rant that began with the president calling for NFL protesters to be fired and continued Saturday with the president rescinding a White House invitation for the NBA champion Golden State Warriors over star Stephen Curry’s critical comments of him. The movement started more than a year ago when former San Francisco 49ers quarterback Collin Kaepernick refused to stand during the national anthem as a protest of police treatment of racial minorities. This season, no team has signed him, and some supporters believe NFL owners are avoiding him because of the controversy. A handful of Miami Dolphins players wore black T-shirts supporting Kaepernick during pregame warm-ups. The shirts have “#IMWITHKAP” written in bold white lettering on the front. Trump’s targeting of top professional athletes in football and basketball brought swift condemnation from executives and players in the National Football League and the National Basketball Association. Sports hasn’t been immune from America’s deep political rifts, but the president’s delving into the NFL protests started by Kaepernick a year ago brought new attention to the issues. “If NFL fans refuse to go to games until players stop disrespecting our Flag & Country, you will see change take place fast. Fire or suspend!” Trump said in a Sunday morning tweet. Trump’s comments drew sharp responses from some of the nation’s top athletes, with LeBron James calling the president a “bum.” Hours later, Major League Baseball saw its first player take a knee during the national anthem. The NFL its players, often at odds, have been united in condemning the president’s criticisms. Patriots owner Robert Kraft, who’s been a strong supporter of the president, expressed “deep disappointment” with Trump. The NFL, meanwhile, said it would re-air a unity spot called “Inside These Lines” during its Sunday night game between Oakland and Washington on NBC. “Inside These Lines” is a 60-second video that highlights the power of football to bring people together. AP Sports Writers Dennis Waszak Jr., Steve Reed, Larry Lage and Stephen Whyno contributed.